UCLA law professor Hiroshi Motomura makes a point as Ali Noorani, UCLA professor Lane Ryo Hirabayashi and discussion moderator Ann Burroughs listen in. 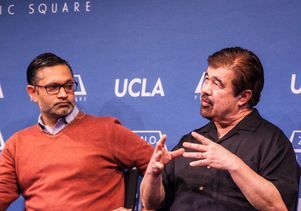 A standing-room-only crowd gathered Wednesday, Jan. 18, in Little Tokyo in downtown Los Angeles to hear two UCLA scholars with expertise in immigration law and the historic underpinnings of the Japanese-American incarceration discuss a freeze on Muslim immigration into the U.S. and a registry of Muslim-American citizens, both proposals floated by President-elect Donald Trump during his campaign. UCLA's Lane Ryo Hirabayashi speaks. 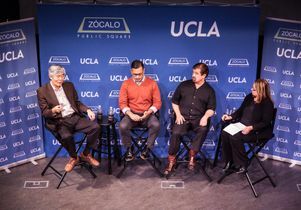 UCLA anthropologist Lane Ryo Hirabayashi, who holds the inaugural chair in Japanese American Incarceration, Redress and Community, and Hiroshi Motomura, a legal scholar at UCLA and author of "Immigration Outside the Law" and "Americans in Waiting,” joined Ali Noorani, executive director of the National Immigration Forum, at a Zócalo/UCLA event at the National Center for the Preservation of Democracy. 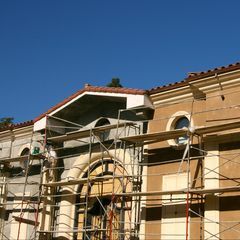 The event was presented in partnership with the Japanese American National Museum. 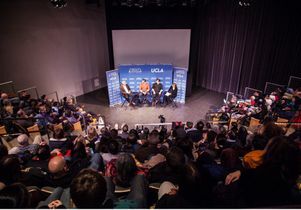 Just as the Pearl Harbor invasion became the trigger that instilled widespread fear throughout the nation and led to the government’s roundup and incarceration of nearly 120,000 Japanese-American citizens living on the west coast 75 years ago, a violent terrorist incident could become the flashpoint that sparks a reoccurrence of this sad history, the panelists said. “We’re facing the specter of that terrible, tragic episode in American history being repeated,” said discussion moderator Ann Burroughs, the museum’s interim president and CEO. Hirabayashi noted, in shadow of Sept. 11, there’s a likelihood that “registries” of people coming into the U.S. from Middle Eastern countries already exist. Patricia Takayama of the San Fernando Valley Japanese American Citizens League asked the panel how citizens might influence what sort of information government agencies are allowed to gather and stockpile. Although a firewall sometimes exists between agencies, Motomura explained, the public would do well to enforce greater transparency, which would put pressure on those collecting the data and also break down the “myths” these agencies may be disseminating as facts. 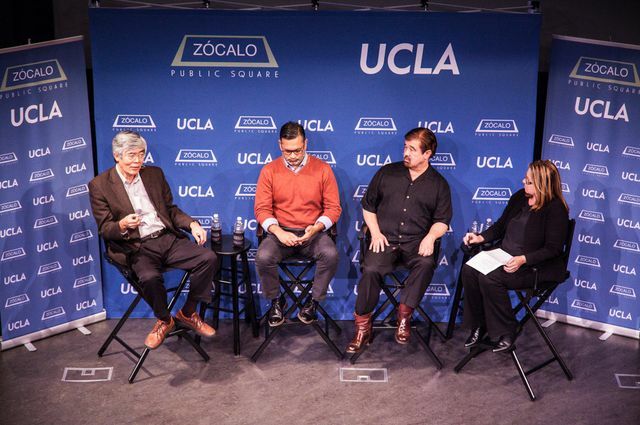 Coverage of the entire panel discussion is available on the Zócalo website.